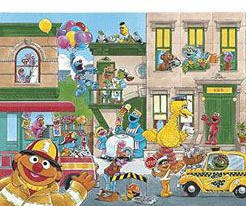 A collection of 24-piece cardboard puzzles featuring children's favorite Sesame Street characters. The puzzles have large, easy-to-handle pieces, so they're perfect for younger children." Size (inches): 8.46" X 10.04" X 1.57"
24-piece cardboard puzzles with Sesame Street characters kids love. Large puzzle pieces are designed for younger children. Scenes are colorful and engaging.